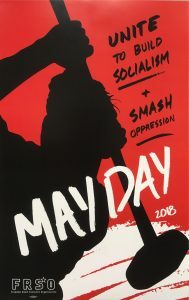 The Freedom Road Socialist Organization presents our Main Political Report, voted on at the recent 8th Congress, May 2018. The three resolutions–economic, domestic political, and international–describe the societal conditions in which we organize and struggle for a new society. The FRSO originally started discussing, debating and revising the resolutions in September 2017. The documents provide a basis for understanding basic conditions, the forces in motion in society, as well as the strengths and weaknesses of the movements for social change and revolution. We ask you to read, comment, discuss and share them. Improving our understanding of how society works will strengthen the leadership of mass groups and positively impact the people’s movements. A basic understanding of the international situation, which includes how the U.S. impacts the world and how changes in the balance of forces on a world scale affect the state of things domestically, is essential for having a materialist assessment of our tasks and the possibilities that exist in our work for the coming period. The U.S. is an empire – its tentacles extend around the globe – and this fact shapes this country’s economic base along with the political/ideological superstructure that is built on that base. Since the early 1970s, U.S. imperialism has been in a period of strategic decline, beset by internal and external contradictions. In 1960, the U.S GDP accounted about 40% of the world economy. Currently, the U.S. economy represents about one-fifth of the world economy, and that figure is falling. Imperialism is the highest and final stage of capitalist development – it is monopoly capitalism, in its moribund, dying form. President Trump is a fitting representative of a system that is historically outmoded and strategically doomed. The principal contradiction in the world today is between the peoples of the developing world and imperialism. The U.S. is the principal imperialist power in the world today, and as such, it is the main danger to the world’s peoples. From Puerto Rico, to the Philippines, to Palestine, people are rising up and fighting for liberation. On a world scale, the globe has been divided up among the relative handful of advanced capitalist countries (the U.S., the European powers, and Japan) and there are four basic contradictions at work: between imperialism and the peoples of the oppressed nations; amongst the imperialist powers; between the working class and the capitalists, and between socialism and capitalism. While these contradictions have been present for the past century and, in some cases, overlap each other, there are new developments that we need to be aware of, and where needed, give additional investigation to. This includes the growing importance of inter-imperialist rivalry. The expanse occupied by the empire of the dollar is without precedent, spanning vast areas of Asia, Latin America, Africa and the Middle East, and covered with a web of military bases, occupations and puppet regimes. The purpose of the empire is to enrich the billionaire class that runs the U.S., who live like vampires on the blood and sweat of the many. That said, behind the bayonets and atom bombs, the U.S is locked into a spiral of decay. The defeat in Vietnam in the early 1970s, coupled with the rise of rise of other monopoly capitalist powers in Europe and Japan, marked the end of U.S. imperialism’s zenith of influence and control. The end of the Obama era and the rise of Trump, coupled with scrapping of trade agreements like the Trans Pacific Partnership and a unilateral approach use of military force, are all signs that sun is starting to set – that the empire of the past was too big for the U.S. hold up. The upshot of this is that we can expect a dramatic sharpening of the basic contradictions – including between the developing world and imperialism, and inter-imperialist rivalry – as the U.S. moves towards a course that is more unilateral, and reflective of its growing isolation, an isolation that is animated by a drive to accomplish by military means what cannot be gained or maintained by economic means. Given two decades of continuous warfare, including the disastrous war in Iraq, and the protracted ‘apocalypse soon’ in Afghanistan, the U.S. is now preparing to amp things up in a big way. For its part, the Pentagon is articulating a strategy which has at its core preparing for war against the People’s Republic of China and Russia, which it now openly defines as strategic competitors. In addition, the Islamic Republic of Iran and the Democratic People’s Republic of Korea are also in the crosshairs. Congress is, and will be for some time, debating a massive military buildup that is needed to put this strategy into practice. In a marked departure from the policies of the past decade; the utilization of “soft power,” including diplomacy and bribery with foreign aid packages, is being downgraded. The U.S. is also manifesting a more unilateral, go-it-alone approach in the economic sphere, particularly on the issue of trade. It can be said the process of imperialist globalization has passed its high tide, and is now in a period of retreat. Protectionism is on the rise as imperialist powers attempt to strength their respective economic positions – which means strengthening advantages in their internal markets and achieving favorable terms for their exports, including the export of capital. In addition to the U.S. abandoning the TPP, it should be noted that since the establishment of the World Trade Organization, trade agreements that are global in reach have stalled. While it’s true that the irrational and unstable Trump administration might manage to provoke war with People’s China or Russia, plans for a war with these countries are long term and strategic, and involve things like a major military buildup and an expanded nuclear arsenal. As far as the here and now goes, there are the ongoing wars – Afghanistan, Syria, Yemen, Somalia, etc. all of which are important – and there is the threat of new wars against Iran and socialist Korea. Also, is should be stated that unending wars, coupled with the drive towards new ones, impact the domestic situation, especially the political and ideological superstructure in some important ways. While the main contradiction on a world scale is between the imperialist powers and the oppressed nations and peoples of the world, the struggle between the imperialist powers is assuming increasing importance. This growing inter-imperialist rivalry is reflected in the handwringing about NATO, which is important, given that is easily the world’s largest and most deadly military cabal, or in moves by the European powers to distance themselves politically from Washington DC. On issues ranging from the Paris accords to the Middle East – it grows lonelier in fortress Trump. All serious observers agree that the Trump administration is unstable, unreliable and frequently motivated by narrow, short-term considerations. Regardless of how long the Trump administration lasts, it is not possible for the U.S relationship with the junior imperialist partners to return to what it was. The struggle between the monopoly capitalist countries is also sharpening within Europe itself and endangers the attempts to bring political and economic unity to the continent. We view the dissolution of the EU as a good thing that tends to weaken imperialism on a world scale, and welcome moves by countries to exit from the EU. Russia is an emerging imperialist power. Under socialism, the former Soviet Union was often guided by working class internationalism in its relationship with the world. Under Putin, that is not the case. Russia is motivated by what it says is its “national interest.” That said, as Russia has played a positive role in a number of places, such as Syria. The contradiction between the socialist countries (Cuba, Vietnam, China, Democratic Korea and Laos) on the one hand, and the monopoly capitalist countries on the other, is undergoing a process of intensification. In all the socialist countries there are issues of national development, class struggle, the problem of revisionism (meaning the departure from the revolutionary essence of Marxism) and capitalist encirclement. The socialist countries have made many spectacular accomplishments. The economies of those countries do not function according to the laws of capitalism. In general, the socialist countries play a progressive role on the world stage. All evaluations need to be made based on seeking truth from facts. All the existing socialist countries have emerged in developing world, and the contradiction between them and imperialism overlaps with the contradiction between the oppressed nations and the monopoly capitalist powers. On every continent there are great battles underway to weaken and defeat imperialism. In the Middle East, the center of gravity is the heroic struggle of the people of Palestine to end the Zionist occupation and to liberate every inch of their land. A powerful camp of resistance has coming into being that unites Iran, Syria, the Palestinian resistance, and the popular forces of Lebanon, Iraq and Yemen – and which is fully capable of challenging imperialism, Zionism and reaction of all kinds. In Asia, where the People’s Republic of China is the target of the American “pivot” or “rebalancing,” the national democratic struggle in the Philippines, led by the Communist Party of the Philippines, stands out in sharp relief and is an inspiration to people everywhere. The Philippines is vital for the projection of U.S. power in the Pacific region. Additionally, the Democratic People’s Republic of Korea (DPRK), despite threats, maintains their sovereignty and continues show their strength, keeping U.S. imperialists at bay. We grasp the truth that political developments abroad can impact the revolutionary process at home, for example, for example, events in Mexico can have great impact on Chicano nation in the U.S. Along with our friends and allies, we are working to build a united front against imperialism. Part of developing that front is recognizing and supporting the fights of the working class in both advanced capitalist countries and the developing world. We reject the idea that the people of the U.S. gain material benefits from empire. We hold that the more setbacks and defeats for the monopoly capitalists who rule this country; the closer we are to freedom. We are proletarian internationalists who share a common enemy (the U.S. bankers and bosses) with the world’s peoples. The existence of this common enemy – coupled with the fact that capitalism anywhere is a roadblock to a society without classes – forms the material basis for internationalism. Previous post Defend Vaun Mayes from modern day COINTELPRO frame-up!